The Knights of Columbus is the world’s largest Catholic fraternal service organization. Founded in the United States in 1882, it is named in honor of Christopher Columbus. There are more than 1.7 million members in 14,000 councils, with nearly 200 councils on college campuses. Membership is limited to “practical Catholic” men aged 18 or older. 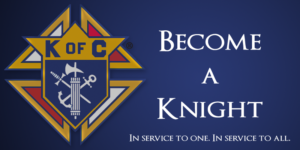 As a fraternal organization, the Knights of Columbus offers not only the opportunity for its member to serve others, but also to join together in other activities ranging from athletic activities, to cultural programs, to social events. Along with these fraternal activities are the programs councils regularly run to assist those of their members and their families who are in need. In October of 1994 St. Isaac Jogues Council # 11428 of Knights of Columbus was chartered in Lake George, NY. Since it’s founding the Council has served numerous organizations, causes and people throughout the region.